If you read our coverage of NCSA Junior Nationals (here, here and here) and thought, “What is that? !” or “How does that meet fit within the swimming universe? !”, you’re in luck! We’re posting a series of articles explaining key meets along the path leading to the Olympics, and we’ve arrived at the point in the series where we discuss Junior Nationals and related meets. 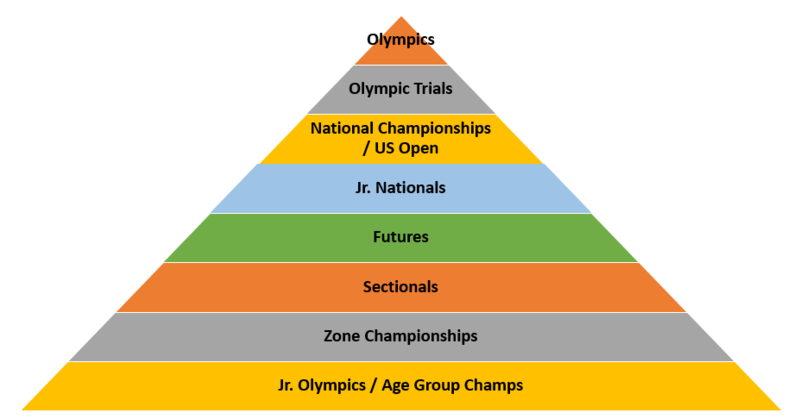 That is, this path begins at the Junior Olympics (JOs), progresses to Zones and Sectionals, and then moves onto the “national” stage at Junior Nationals and the new-ish Futures Championships, both of which we discuss in this post. The graphic above summarizes the overall path. Our story begins in 1999 when USA Swimming, the governing body for the sport of swimming in the United States, decided to eliminate Junior National Championships in 2000 and to replace them with lots of Sectionals meets in order to accommodate far more swimmers. This decision, however, left many club coaches feeling that they had lost a major part of their system for developing elite 18 & under swimmers. To fill this void, the National Club Swimming Association (NCSA) was formed and began sponsoring Junior Nationals beginning in 2002. Although USA Swimming returned to sponsoring a long course Summer Junior National Championships in 2005 and a short course Winter Junior Championships in 2008, NCSA still sponsors a Junior National Championship in the Spring. Athletes at all three of these meets must be 18 or under on the first day of the meet in order to participate. 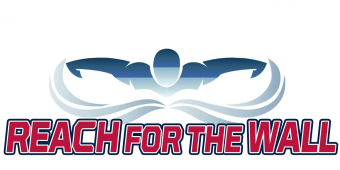 The National Age Group Swimming Association (NASA) / International Swim Coaches Association also sponsors a Spring Junior National Championship Cup, but athletes up to age 21 can compete in it. So, the sport has gone from having no Junior National meet in 2001 to having at least four today. But even this growth has not been enough to accommodate the 40% increase in the number of 13 & over swimmers since 2003 (i.e., an increase of 44,000 athletes). This growth has caused two related problems: (i) USA Swimming’s winter and summer Junior National meets have reached maximum capacity; and (ii) to limit the size of these meets, USA Swimming has made it more difficult to qualify for them. But, making the qualifying times for Junior Nationals faster has moved them farther away from those for Sectionals (and closer to the cuts for the National Championships), thus making it harder for swimmers to make the jump from Sectionals to Junior Nationals (and easier to go from Junior Nationals to Nationals). They created a new summer “Futures Championships” meet (Futures) that provides swimmers with a new stepping stone between Sectionals and Junior Nationals (see e.g., Futures’ qualifying times vs Jr. National’s qualifying times). Some think of this Futures meet as a “junior” Junior Nationals. The USA Swimming Summer Junior National Championships that will be August 8-12 in Minneapolis, Minnesota. And, for those swimmers who don’t quite qualify for summer Junior Nationals, the Futures Championships provides another forum to improve their times. The 2016 Futures meets will be August 4-7 at four sites around the country: Purdue University in Indiana; Greensboro, North Carolina; Mt. Hood, Oregon; and the University of Maryland – College Park. Having a Futures meet in our backyard is convenient indeed for PVS swimmers! And for older swimmers in our area, note that Futures are open-age meets not limited to 18 & unders. The format for these various meets is as you would expect, except with some twists. That is, USA Swimming’s Winter Junior Championships are in short course yards, but have long course time trials at the end of the meet for those swimmers trying to qualify for long course meets (e.g., Olympic Trials). At both NCSA’s and NASA, which are in the Spring between short course and long course seasons, the “prelim” sessions are swum in short course yards and finals are swum in long course meters, giving kids an opportunity to swim both pool lengths in a single meet and an opportunity to make an Olympic Trials cut in finals (but note Swimguy’s helpful comment below). NCSA’s and NASA also have time trials in short and long course yards. And finally, USA Swimming’s Summer Junior National Championships (and time trials) are only swum in long course meters (no short course time trials). What are “time trials”, you ask? Say you are swimming at one of these meets, and don’t quite make the cut you need. Well, if you are really close to that cut, you can pay a small amount (e.g., $5-10) to swim your event again in time trials after the meet ends to get another chance to make your cut. Ok, but how do these various Junior National meets compare to each other? Are some more “prestigious” than others? Well, the qualifying times for USA Swimming’s Summer Junior Nationals (here) are the fastest, followed by USA Swimming’s Winter Junior Championships (here), NCSA’s (here) and then NASA Junior Nationals (here). But, all these meets are really fast for which only a small percentage of swimmers ever qualify, so they all are pretty prestigious. In our next post in these series, we will discuss the next meets up from Junior Nationals (i.e., the various National Championship and US Open meets). NCSA Junior Nationals are short course prelims/long course finals only during The Olympic Trials qualifying periods–Olympic years and the year before that. For example, in 2013 and 2014, NCSA’s were short course prelims/short course finals. 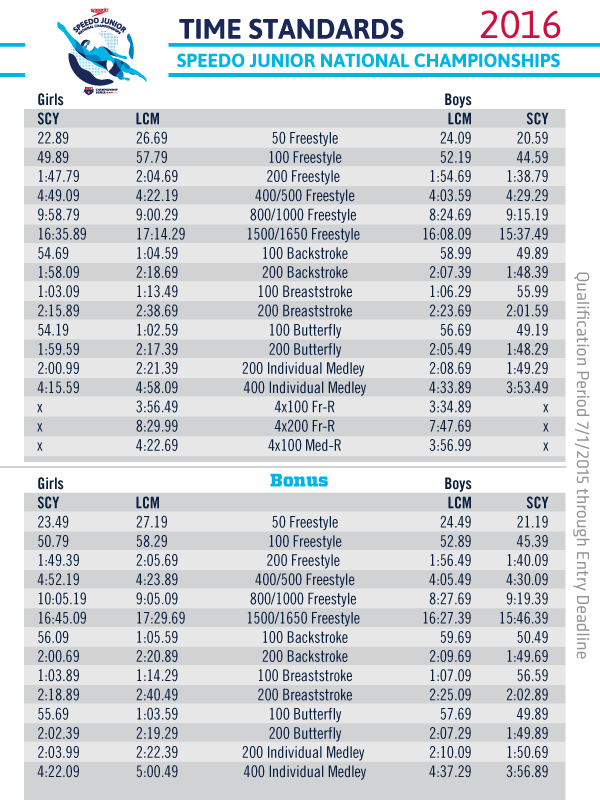 In 2015 and 2016, after the qualifying standards for the 2016 Trials were released, NCSA’s were short course prelims/long course finals, to give the fastest swimmers in the meet a chance to make Trials. Next year, NCSA’s will be back to the all-short course format. Futures qualifing times seems faster than NCSA ‘s at least this year 2017. Is it still going to be 4 places or one ?